Washington Silk works with young children and teens as part of his work with KW Counselling OK2BME program. Too often, they come across heartbreaking stories of young children facing shame and isolation just for being themselves. Trans people face unique barriers in the healthcare system. The Transgender Health and Wellness Conference (THWC) was organized to address this problem. It took place on Nov. 17, in the Kitchener campus of the Michael G. DeGroote School of Medicine and brought together healthcare providers, educators, social workers, and anyone who was interested in sharing information on treating transgender patients. Ashley Flanagan, a PhD candidate studying transgender aging, was one of the organizers of the committee. “The main goal of this whole conference was to bring everybody together, [and] up to speed and get people thinking and get people recognizing that there is a need in the Waterloo Region,” Flanagan said. “A lot of people think that it’s more of Toronto-centric thing […] What we’re trying to do is build capacity in our region, so that we don’t end up having to send trans patients and trans students and non-binary folks out of the region and put them on waitlists… If we create capacity in our own region, we will be able to better serve not only our community but communities around us as well,” she said. Cait Glasson, president of Spectrum – Waterloo Region’s Rainbow Community Space, was also a panelist at the THWC. She related her experiences from coming out in the 90’s and the changes that she has seen now. She emphasized the importance of hearing, ‘yes’ from healthcare providers. “For me, the message that I want to get to healthcare providers is to be the yes. Be the person that says yes because our experience of the healthcare system is overwhelmingly of people saying no. ‘I can’t do that for you,’ ‘I’ll find somebody else who can do it for you,’ it’s always no. And if we could find somebody who would be more inclined to say yes, we would have a lot better outcomes,” she said. While not knowing the correct way to treat someone is a valid reason to say no, Flanagan suggests that healthcare providers shouldn’t stop there. “To try and keep doors open I think is the biggest thing […] Learn how to say yes. Rather than shut down folks that come to you for help,” Flanagan said. “Don’t say no and let it stop there […] do your due diligence and try to look into things because trans patients are still your patients. I think not knowing is an impetus to learn more and to try and to go that next step,” she said. On campus, trans students face the similar issues. Milas Hewson, Administrator of Wilfrid Laurier’s Rainbow Centre, shed some light on barriers to trans healthcare on campus. “I know that it’s perceived as sometimes a challenge, accessing healthcare on campus,” who said. “I know that there’s efforts to be improving it, I know that we put on trans-allyship workshops and we’ve had folks from the wellness centre attend those workshops which is a good sign. But there’s always more work to do and we are hearing that students definitely have difficulty accessing on campus healthcare system,” Hewson said. Dr. Michael Lee-Poy, one of the project coordinators for the THWC is the 2017 recipient of the Reginald Perkin-Family Physicians of the Year award, which recognizes leaders in medicine, and co-developer of the TransEd program for healthcare students. He said that mostly, people just need respect. “I think the big thing is that people want to be respected for their identity. Receive respectful interactions, respectful care, respectful service and a big part for them is that they need to have gender-affirming care, care that recognizes their identity and … they don’t want to have to constantly prove their gender, they want people to acknowledge their identity, and then move forward,” Lee-Poy said. Letting people know that they are not alone can have significant effects on their health as well. “I was not alone. When you talk to kids and you talk to people, affirming that they are not alone is so important, and getting them to meet other LGBTQ folks is so powerful and so affirming,” Silk said. Many barriers come into play for trans people. Very few physicians provide them with the care they need, and many of them are in different cities like Guelph, London, or Toronto. Trans folks also need to see their doctors on a more regular and frequent basis. An added barrier is that many trans patients have to convince their doctors to provide the care they need. It took Glasson twelve years to convince her doctor to prescribe hormones for her. Still, Glasson is happy with the progress that has been made, and hopeful for more progress in the future. Lee-poy will keep going forward. 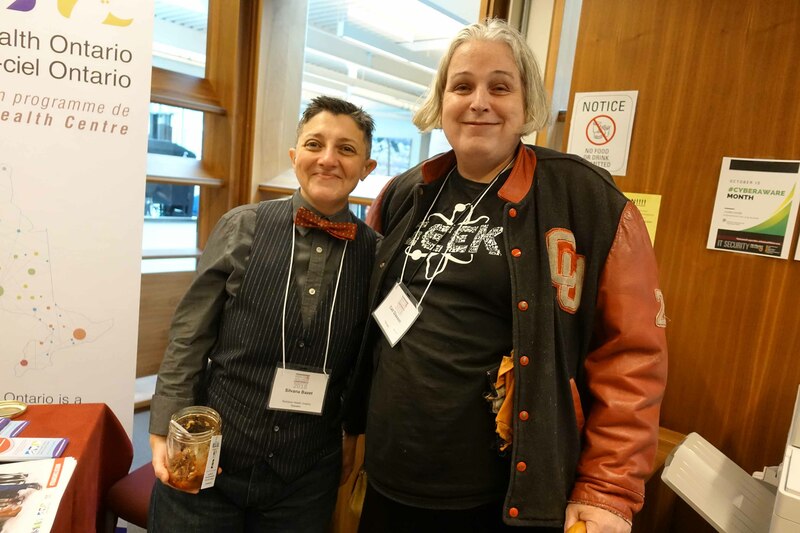 “I think this conference is great because it really emphasizes the importance of transgender health and wellness, and what we can do as healthcare practitioners and as a society, It also brings people together […] we can do so much more together than if we just try it on our own.” Lee-Poy said.